Make sure everyone's luggage arrives safely when you share these personalized luggage tags with friends and family! 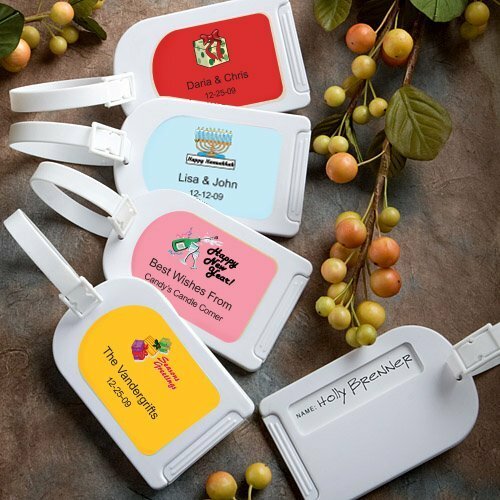 Celebrate a special occasion with these unique favors, crafted from durable white plastic. Each 3 1/4" by 2 1/8" tag comes with a white pvc strap and a custom label displayed on the front. Choose from more than 30 background colors and over 200 design images, then add your own text for a label suited to your event. The back of each luggage tag has a display window and a slide out compartment so guests can enter their name and address information. Minimal assembly is required to adhere the labels to each favor.